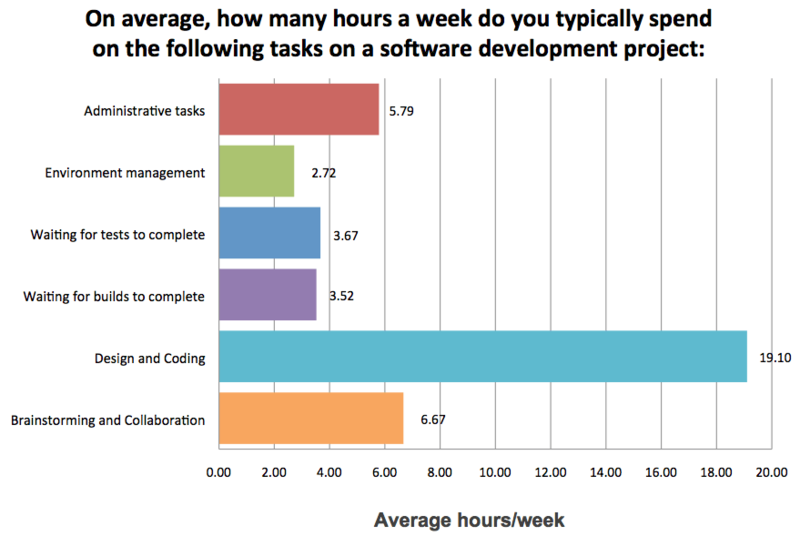 Software engineers spend more time on administration and other tasks than they do on actual application design and coding, according to a survey of developers by software development tools vendor Electric Cloud. As managers, the most effective way to maximize the number of chunks of flow our teams get is to clear the calendar. In this context, what types of calendar items constitute an interruption? Basically, anything. Regular meetings, 1:1s, interviews are all obvious interruptions. Here are some common top-down strategies to minimize interruptions. Again, our baseline is the industry average two flow hours a day, or ten flow hours a week, and our goal is twenty flow hours per week. Also, remember we are assuming a maximum of five effective hours per day. The most popular strategy is to have an entire day per week with no meetings, where everyone can be heads-down. You might combine that with giving people permission to not answer email/Slack, or work from home. The great advantage of this tactic is that it’s easy to communication and understand. It’s also relatively easy to get buy-in to delay a meeting by at most one day. In the best case scenario, this translates to a one four-hour chunk per week and four two-hour chunks a week, for a total of twelve flow hours. If you hold all meetings on one or two days a week and leave the entire rest of the calendar free, you would have three or four four-hour chunks per week. Assume that the one or two days you actually have meetings are complete write-offs. That results in a total of twelve to fifteen flow hours. You could block off three to four hours every day for interruption-free working time. This could take the form of never scheduling meetings before lunch, or between 1 pm and 5 pm, etc. In practice, it would be important to align this with times people are actually in the office if you allow flexible work hours. This would result in five three- or four-hour chunks a week. Any non-free time can be assumed to involve interruptions. Let’s estimate fifteen to twenty flow hours. Given that engineers are going to get at most five effective hours a day, the ideal set up from a flow perspective is to get a three- to four-hour chunk of time blocked off every single day with no interruptions. Interestingly, this is 80% as effective as never having any interruptions at all – the equivalent of a 100% meeting free week. It’s also the same twenty hours of coding that engineers are typically getting, but a 100% increase in the number of coding hours “in the flow”.